This is one of my favorite B&W shots. It was originally published on an all Black and White web site last year. 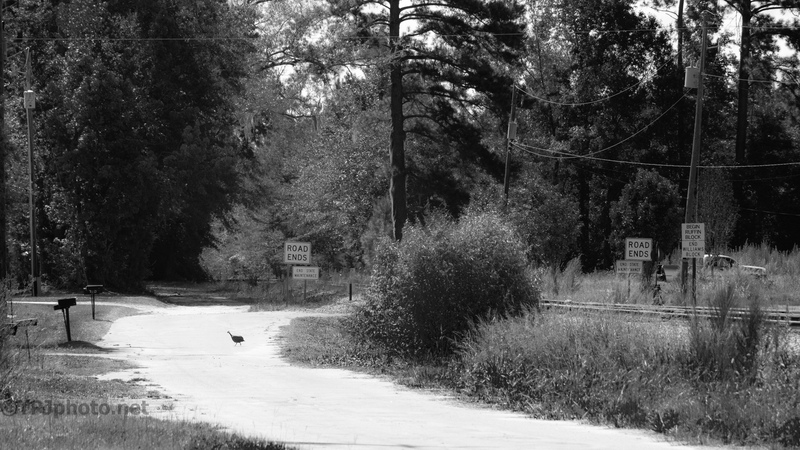 Shot in a small rural town in South Carolina, the main focus of the image was the rough end of an old dirt road. And signs by the RR track were clear, the road ends. a small Guinea Hen walked out into the shot. I like to think of this style as ‘rural street photography’. Not my normal ‘stuff’, thanks. I have a few more old ones like this to update. I like wandering around the older towns down here, but a lot of rust and ruin. Since I’m new to the south it’s all new to me. A lot like shooting the old mill towns up north. Down here they seem to re-purpose things much better.